Are we Muslims, or are we Shi’ites and Sunnis?! For whose benefit is this? It is for the benefit of the “other” that we are speaking about, for the benefit of the enemy, for the benefit of colonialism. “The Fatimid state arose in the beginning of the 10th century, and it formed an umbrella over North Africa, and under its banner all of the tribal, denominational, political, and ethnic differences fused, and they all became one single Fatimid identity, which lasted 260 years and extended as far as the Arab East. “This grand Fatimid state generously allowed the existence of the mini-states in its interiorů They all became Fatimids, and there was stability. “Now people say to us that the Shi’ites are in Iran and that Shi’ite means Persians, and Sunni means Arabs. This is a lie. This is deceit. Those who say this are ignoramuses who do not know history. “In North Africaů go anywhere and ask them about their customs and traditions. They are all Shi’ite customs and traditions. “[They include] the celebration of the ‘Ashura, the sorrow on the ‘Ashura and the remembrance of the ‘Ashura and our lord [sayyidna] ‘Ali; the very extensive stories about our lord ‘Ali, and being the party of [tashayyu’l-] our lord ‘Ali. “[The North Africans] do not know Mu’awiya [‘Ali’s rival and the founder of the Umayyad dynasty]. From Egypt to the Atlantic Ocean, there is not a single person named Mu’awiya. They are all named ‘Ali, Fatima, Khadija, Hassan, Hussein, etc. “Since the [trend] today is religion, and [discussion of] who has the right to the Imamate, and what is the Imamate, and so forth – who has more right to the Imamate than the Prophet’s family [ahl al-bayt]? The Prophet’s family has more right than all of the rulers around today who are not from the Prophet’s family. “When we come to religious authorityů have [people] not gotten themselves into a mess and said that the Sunnis are against the Shi’ites and the Arabs against the Persians? Who holds to this view? It is the foreign occupation and the Zionist settlement that brought this. “The Shi’ites are North Africaů We will [build] the modern, second Fatimid state, and its identity will be a Fatimid identity. The Arabs and the Amazigh Arabs will be fused in it, and the parties, the Left and the Right, the extremists, and the proponents of violence will be fused in it. All of them will become a single identity. “The conflict in North Africa will end. The conflict in Algeria will end, and in Sudan, and the conflict in Egypt will end, and the conflict in the Sahara will end. Tribal, sectarian, and ethnic conflict will end, because we will have become Fatimids. “We in North Africa are Arabs, and North Africa is 100% Arab. Those whom we say are ‘Amazigh’, are the original, unadulterated Arabs. The fact that France and Western colonialism say to them ‘you are not Arabs’ – whoever accepts this will bear his responsibility. “North Africa is Arab and Shi’iteů The Shi’ite Fatimid state arose in North Africa, and not in Iran. We want to revive it once again. We direct a renewed call to all of the forces in the first Fatimid state to revive [it in] a modern, second Fatimid state – on the condition that it be free of all of the sectarian conflicts and [the debate about] the Imamate and [religious] rule [hakimiyya] and the sophistry of old. “We are not interested anymore [whether] Ja’far Al-Sadiq delegated the Imamate to Musa Al-Kazim or to Isma’ilů  This matters [only] to Ja’far Al-Sadiq and Isma’il and Musa Al-Kazim, and they are gone, may Allah have mercy on them. “[And we are not interested anymore] in who had more right to the Caliphate, ‘Ali or Mu’awiya. The Caliphate has nothing to do with religion, and this is a worldly struggle for rule. If they decided after the Prophet who would be ruler, it was because the Prophet was not a ruler. He was a prophet, that’s it, and then he passed on. He was a prophet, and he died, without a son, a successor, a regent [wasiy],  or a representative. “But emotionally, we the Arabs, and all of the Muslims, are attached to ‘Ali. This means that all of the Arabs are Shi’ites. If a Shi’ite is one who is attached to ‘Ali, then all of the Arabs are Shi’ites. Where is the Arab who is against ‘Ali? There aren’t any. “If Being Sunni Means That You Believe in Muhammad and His Sunna. Then the Iranians are Sunnis. Did the Iranians say to you: ‘We are against Muhammad’? No, they say: ‘Muhammad, peace be upon him, is our Prophet.’ [And if you ask them:] ‘Do you follow his sunna?’ they will say: ‘Of course, we follow his sunna.’ Then you are Sunnis? Yes, indeed. “And they will come to us here, us the Muslim Arabs in North Africa, and ask: ‘Do you love ‘Ali?’ We will say: ‘Yes, we love ‘Ali.’ [They will ask:] ‘Do you love ‘Ali or Mu’awiya?’ We will say: ‘We love ‘Ali.’ Then you are Shi’ites. “No, no. We in North Africa are the modern, new Fatimid state. We are Shi’ites. That’s it, the Shi’a has moved now from Iran to North Africa. The second Fatimid state must arise. “Enough, then, the dispute has ended. “There won’t be an Arab Maghreb Union, or a non-Arab Maghreb Union. No longer will one be against the other, or will there be war one against the other, and borders. What borders? They don’t interest us. “[In the] Fatimid state you can remain Egyptian, Libyan, Algerian, Tunisian, Mauritanian, Nigerien, Malian, and so on, and [you can] stay in Sudan, in the Fertile Crescent, in Jordan – but the identity will be a Fatimid identity. “If rule is [in the hands of] the Prophet’s family, then no one has more right than the Fatimid state, which descends from Fatima al-Zahra. And if rule is a matter of worthiness, understanding, and democracy, then hand rule over to the peopleů and put an end to governments, kings, and presidents. “If you bring Islam into politics, then the Prophet’s family has more right than all of you, oh you who take advantage of Islam. Who are you to rule in the name of Islam? If you want to rule in the name of Islam, then the Prophet’s family is most worthy and has more right. “The Fatimid state grants freedom to everyone to worship in complete freedom. One is a Shafi’i, another a Maliki, another an Ismai’ili [Shi’ite], and another [follows the] Khawarij [KHARIJITES]. “How can we find one mosque that people say is Shi’ite, and another mosque that is Sunni ? ! Who holds this view ? In the days of the Prophet, was there a mosque for the Shi’ites and a mosque for the Sunnis?… They are all Allah’s mosques. “Does one have a qibla to the right, and another to the left? Do they not all face the sacred house [i.e. the Ka’ba in Mecca]? “While we’re on the subject, the two holy sites are not the two that we say they are today. The two holy sites are Mecca and Jerusalem [and not Mecca and Medina]. “We thank our Persian brothers, who joined the party of the Prophet’s family and of ‘Ali. We thank them for joining [the supporters] of the Prophet’s family. This is a tremendous thing. “I am amazed that people from the Prophet’s family, like [King ‘Abdullah] in Jordan for example, are against the Shi’a. What does the Shi’a mean? It means being the party of [tashayyu’ l-] the Prophet’s family. It means that we are the party of you, you there in Jordan. I am your party, when I am a Shi’ite in Iran. In an earlier speech on 01 March 2007, al-Qathafi denied the existence of a non-Arab Berber people in North Africa. He said that they were Amazigh, not ‘Berber’ ! “We set out from Yemen until we came here [to Libya]. We went by land, by land [barr barr], so they called us ‘Berbers’. “The Amazigh  tribes died out a long time ago, since the days of the Kingdom of Numidia. These are tribes we don’t know at all. Perhaps they were Semitic or Eastern [tribes] who came [to the region], but they died out and are no more. “Where are the tribes of Mishwash, Ribu, Libu, Samu, and Tihnu? We can’t even pronounce their names. “The archaeologists and the astronomers say that these tribes died out during a 100-year drought. There was no rain in North Africa, and everyone died out, including the Amazigh tribes and the other tribes I mentioned who were all in North Africa – they all died out. The ‘Amazigh’ [barr barr] Arabs and the Phoenician [bahr bahr, i.e. “sea-sea”] Arabs arrived, and [then] the [other] Arabs came after Islam. “Libya is for the Libyans. We will not tolerate in Libya any ethnic zealotry [shu’ubiyya]. No one can say ‘my origin is this, that, or the other’. Whoever says this is an agent of colonialism. This is ‘divide and rule’. al-Zahra (“the Radiant”) is an epithet added by Shi’ites to the name of Fatima, the daughter of Muhammad and the wife of ‘Ali, and al-Azhar is the corresponding masculine form. Al-Azhar in Cairo, today one of the foremost bastions of Sunni orthodoxy, was originally established in the late 10th century by the Fatimids as an Isma’ili Shi’ite institution. Ja’far Al-Sadiq is considered by Shi’ites the sixth Imam; the question of the identity of his successor led to a split between Isma’ili Shi’ites (the Fatimids’ sect) and Twelver Shi’ites, the sect followed by most modern Shi’ites. Wasiy is the term Shi’ites use for ‘Ali in order to express his status as the rightful successor to Muhammad. Wikalat Al-Jamahiriya L’il-anba’, 01 April 2007. “Amazigh”, literally “one who is free”, is a term many ‘Amazigh’ prefer when referring to themselves. Mu’ammar al-Qathafi celebrates the birthday of the Prophet [PBUH] in Kampala, Uganda and gives a lecture in the teachings of Islam. ‘The Message’ was financed and produced by Muammar al-Qathafi. Read the complete ‘Gospel of Barnabas’. In any case, Jesus/Issa repeatedly told his apostles that Mohammed (PBUH) would be coming, after him…and who he was. “The main objective of the plot of the Arab Spring is to bring about chaos and the creation of failed states to distort and destroy national armies where the media tried to hack described (Ktaib Gaddafi in Libya. Lashkar-e-Mubarak in Egypt. Shabiha al-Assad in Syria. Thugs Saleh in Yemen). He was able intensive media campaign to deceive a lot of people that have ratified. There were burned and insulted and Khount destroyed and isolated and imprisoned and killed. It ended the scene, who described the time short of revolutionary, and that in fact a systematic chaos to achieve the objectives of the conspiracy. The people woke up to a severe crisis of rampant crime, drugs, kidnapping and loss of sovereignty and the evolution of the scene of the disaster spread of terrorist groups that possessed arms and money and political support by the leaders of the revolution crept slogans of the pyramid of power. In Egypt, the army was able to quickly pick up the mess and came back strongly to turn the tables on the whole plot and designed its Brotherhood ‘customers’ in prison after awakening massive popular demonstrations restored minds of awareness. In Libya, after NATO Crusader intervention, there was confusion between external support and internal chaos and the media tried to continue to deceive the street, through ‘the rebels’ and the MB Armor-Shields, Zidane Army. Security committees. The Libyan army, which has a strong track record of eliminating terrorist groups, now has to confront NATO. Yemen is no different in the case of chaos led to the internal division fueled by overseas reached the fighting and enter the Gulf traveled. And the positive failure of all Yemeni to return to the dialogue table (which will merely result in the return of coach and specialist Bhacleth), the Yemeni Army and its Houthi leaders, are a factor which ensures the stability of Yemen. Syria also in chaos and distortion and terrorism and external interference in the country. Enter the fierce urban warfare destroyed and abandoned millions. To get in the end to some frank remarks and some hint that the true ‘Syrian Army’ is to be the primary force to eliminate terrorism and restore security and stability. Today those armies prove to be a national distinction and bravely faced the plot and did not undermine the determination of media distortion campaign; nor the denial of the multitudes deceived nor fleets abroad and has the historic duty. While the shame of those who stationed prosecuted for conspiracy and reneged on their covenant and oath. The kidnapping of the citizen (Walid M’Barek al-Orchwena) born ‘Parwa al-Hillh’, from his home, and in front of his family. He is a married man with three children, and is a normal employee with a medium-health physical condition. ‘Support directorates of the western region and the security of the southern force 200’, has arrested 20 people on suspicion of belonging extremist groups. ‘Room Zintan operations’ a partagé la vidéo de Jamal al-Kafali. Why launched a lion .. This section of the training the last installment in the Zintani ‘battalion Lightning’ Balnkulaih before the war fighter, and the Muslim Brotherhood, and the Kharijites and al-Jhoyen populists and neo-al-Ancksharien, Ali Brigades al-Ehih and their destruction of the ‘International Tripoli airport’.. This is the fear and the work of the Kharijites and the ‘Muslim’ Brotherhood and criminals to deform with full force and is a true professional Army includes all youth Libya .. These guys have persevered against ‘Roma Libya’ for a full year’s of scheming; and still Amichqon arms in their positions and would not mind, they even congratulated them for throwing Boogad leader and followers of the boy, and al-Baghdadi and criminals at sea ..
From ‘Zintan International Airport’, greetings from the cadre of ‘airport security’. Closing shops merely with Ba sticks and chairs, are still in effect, as a result of all the peace and safety felt by the citizens within Zintan’s security Vallahm, thank you for this blessing ! Clashes in the city of Surman resulting from the killing of ‘Slaman Mahjobe’*, a militia-Criterion. Clashes between militias Aharaded Aamahajip with explosions heard inside the city. Zliten’s ‘Corner al-Aasamarah equipment Mosque’, Sheikh Abdul Salam Asmari Fetouri to commemorate the Prophet’s (PBUH) Birthday. If the celebration of the birth of the master of creation haram Mbda every innovation every innovation is misguidance !! It is the first not to disrupt the people’s interests and lock orbit, hospitals, government agencies disabled anniversary of his birth in the door !! And never to Aodawa here to celebrate, but I wanted to clear !! And the idea, is that after tomorrow, we will raise the green flags, and live up platforms and adorned squares, and speeches and organize a notification for all, to the memory of our independence of the Kingdom of Libya [‘al-Fateh 1969, 01 SEPTEMBER’]!! What say Dear Preacher ? Independence greatest generator or master objects !! Dear Sirs ate more of prayer for the beloved Prophet (PBUH) brigade nation holder doomsday first player, to move the doors of paradise to enter his pelvis and Almhf us. O Allah, bless him and recognition of a lot. ‘Sheikh Muhammad al-Madani Mark al-Chuirv’ participates in the celebration of the birth of Prophet Mohammad (PBUH) inside the lighthouse at Asmari. The death of ‘Ahmad Taib al-Zentate’, after shooting from a Toyota burning car, MAFIA STYLE. Maltese Prime Minister Josep Moskat, has announced that country nationals are advised not to travel to Libya. Jardan al-Tagah leave for ‘Burj al Arab Airport’ in Alexandria, Egypt. Video- Russian strikes have helped weaken the rebels, Syrian troops were preparing to reclaim the old economic capital with massive aid from Iran and, making ambushes upon ‘Daash’ troops, untouched by bombing, as decided by Moscow. The former Syrian economic capital of Aleppo, seems to have become, in recent times, the objective of both the brave Army and its allies, against ‘Daash’. Several thousand Iranian soldiers would be ready to support the Syrian army offensive to reclaim the city in the hands of the evil insurgents, a coalition of the al-Nusra Front, the Syrian branch of al-Qaeda and its Islamist allies. “The decision was taken” told Reuters, by a regional manager. This offensive runs parallel to the one launched in the Hama region, further east, by the Syrian Army in alliance with the Russian aviation. The massive presence of Iranian troops in the region of Aleppo has been confirmed by the death last week of Iranian General Hossein Hamedani. He was killed in Qweires airport near Aleppo. The Revolutionary Guards, the original body, denounced the involvement of “terrorist Daash” in the death of Hamedani. 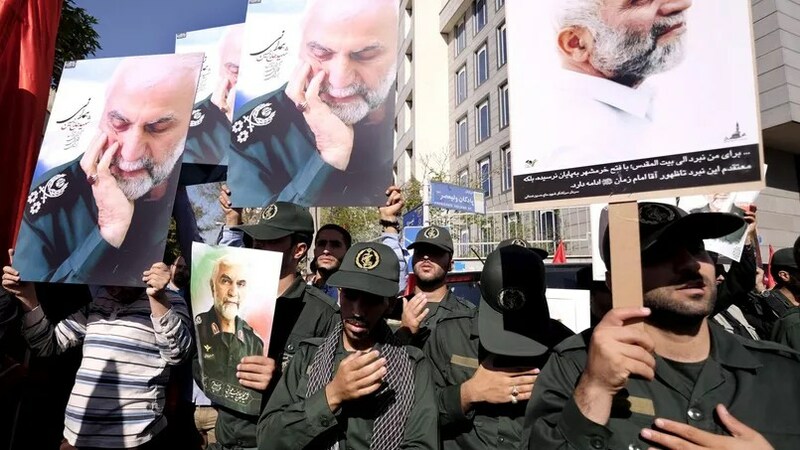 The spokesman of the Revolutionary Guards has recognized on Iranian state television, that the senior officer had been “the last four years one of the most influential military advisers have played a critical role” in Syria. The direct military involvement in Iran alongside the Syrian regime is not new. In the spring, the Iranian general Fahberi Mahdi, head of Fatimioun battalion had fallen in combat facing the Kharijites in the south. But today the mobilization of Iranian troops seems more massive. 5000 members of the al-Quds force would be deployed throughout Syria, in Aleppo as well as in the defense of Shiite villages in the south. Between January and May 2015, 791 barrels fell on Aleppo, killing 860 civilians, including 24 children. Terrorists are (so-termed) ‘religious based’ on “Wahhabism”, the official ‘religion’ of Saudi Arabia and holding the royal family. These groups had been used by Europeans in 1916 by France and England, when they “encouraged” the Arab tribes against Turkey in a terrorist war waged by the British spy “Lawrence of Arabia”. Then, with the Arab anti-colonial, anti-imperialist and secular revolution of the 50s, these religious groups were of no significant influence. Recall that Bin Laden was of the royal family, was sent to Afghanistan to organize the Taliban against the former USSR, with arms and advisers to the CIA; and Saudi funding. They have modern weapons, satellite and operational intelligence, medical equipment, replacements, vehicles, tanks and now say they have even an Air-force. And, where the oil goes, goes ‘DAASH’. More than five years ago, the government of France embarked in destabilizing Syria to overthrow Assad’s democratic government, and restore a colonial project in the area. Such thinking, at this time, is pathetic. For it was associated with Turkey’s Erdogan and his project of “neo-Ottomanism” with imperial nostalgia; with the medieval, obscurantist and bloody Saudi monarchy and the emirate of Qatar, whose petrodollars “feed” European political campaigns. Recently the prestigious US magazine Foreign Policy, said: “Ridayh is the author of tragedy in Paris since 1970 by exporting terrorism”. The New York Times said: “Saudi Arabia is the white Daash“. French President Francois Hollande acknowledged that France had given, and is still giving weapons to the “Wahhabi Kharijites” and to SAUDI ARABIA. A confession of parts I relay testing! The security and stability of the world is at stake and to ensure the same, we must be very precise on these issues of international terrorism and not to mislead public opinion with euphemisms like talking about (so-called) ‘moderate rebels’. More when we see the consequences of actions that occurred recently in France, Europe is on tenterhooks; and the Wahhabi are terrorizing the world [made by Wahhabi indoctrinated in schools supported in Europe by Saudi Arabia agents]. So, we must identify the enemy, if we really want very well ‘world peace’—or it it merely an explicit ? Former head of the Pentagon, Chuck Hagel: Is Daash the US enemy, not al-Asad ?. And especially considering that a recent report indicates that in the ranks of DAASH / ISIS are 23 Argentines and three Brazilians, which puts us in the eye of the storm. Written by Carlos Pereyra Mele, director of ‘Geopolitical Dossier’. A-1 ballistic missile Qaher Yemeni national production. A Yemeni Qaher-1 ballistic missile impacted on Wednesday on a military base in Khamis Mushait, Asir, bordering Yemen. This missile fired by the Army and the Yemeni popular movement Ansar-Allah reports Yemeni news agency Saba , has caused great destruction in the Saudi military facilities from which it was launched and possibly caused the death of some soldiers in Saudi Arabia. This attack was carried out in response to the continuation of the Saudi air strikes being carried out despite the ceasefire between the parties that entered into force on 15 December. In the day today (Wednesday) Saudi fighter jets have carried out air strikes on different areas in the province of Al-Hudaydah (west) and, in addition to causing great destruction, have killed an unspecified number of Yemeni. Saudis smoke from bombing in Yemen . Ridayh takes intense bombing of Yemen, mostly cause civilian deaths , and has deployed mercenaries and soldiers from other countries to try to take control of Yemen starting from its southern shores. ‘Abdul-Malik al-Houthi’ said that the people of Yemen, through Islamic values, resist aggression against the tyrannical regime of Saudi Arabia and its mercenaries. In a speech to mark the birth of the Prophet of Islam, Hazrat Mohammad (peace be upon him), the leader of the Yemeni popular movement ‘Ansar-Allah’, ‘Abdul-Malik al-Houthi‘, said the Yemeni people continue to fight against the Saudis, Americans and Israelis. The Yemeni leader also warned about the enemy plans to divide Muslims. He said terrorist groups like EIIL takfiri group (‘Daash’, in Arabic) and al-Qaeda are tools of the enemies to divide Muslim nations. International analyst ‘Mahmud Aid’ approaches the subject from Tucuman, Argentina, in an interview with HispanTV. Yemeni fighters of ‘Ansar-Allah’ popular movement. More than 50,000 troops from the Yemeni Army, supported by the popular movement Ansar-Allah, prepare to launch large-scale attacks against strategic towns in southern Saudi Arabia. As a first step, Yemeni troops break the defense lines of “the aggressors and mercenaries” in the border region of Jizan and Asir in the town, both in southwestern Saudi Arabia, and then seize strategic points south Arab kingdom, reported Wednesday the Iranian Fars news agency, citing a Yemeni military source, who spoke on condition of anonymity. With these operations, Yemeni forces plan to respond to the military offensive launched in March by Ridayh against Yemen without authorization from the United Nations (UN) in order to eliminate Ansar-Allah. The Russian warplanes destroyed two long convoys of ISIL’s oil tankers in the Homs province. The first convoy with at least 8 oil tankers and some other military vehicles was targeted by the Russian Air Force near the city of Palmyra. Militants accompanying the convoy were also killed in the air raid. The joint squadron of the Russian and Syrian frontline bombers also destroyed 14 oil tankers and their guards near Sukhnah. According to the reports, the Russian and Syrian Air Forces have been focusing their efforts in the Homs province. The activity is aimed to support the Syrian Arab Army (SAA) military operations and to cut the oil smuggling routes in the area. The Syrian Air Force carried out sorties against gatherings and movements of the Jaish al-Fateh terrorist alliance in the area of the Khan Sheikhoun town. Several vehicles equipped with machineguns have been reportedly destroyed. The Syrian forces also exercised a special operation in the western side of town. Six terrorists were killed including Khaled al-Bahri, the leader of a terrorist group affiliated to al-Nusra. Separately, the Syrian Air Force destroyed dens and fortified sites of Jaish al-Fateh terrorists in Kafar Zeta, Mourek and al-Lattamneh towns in the Hama province. The SAA is conducting military operations to liberate the Jobar district of Damascus from terrorists. According to the reports, about 16 Jaysh al-Islam militants have been killed since yesterday. Meanwhile, the SAA conducted separate offensives in the Marj al-Sultan and al-Nashabiyeh villages near the capital. 14 members of the Jaysh al-Islam terrorist group were killed during the clashes. On Monday, at least a dozen civilians were reportedly killed in two air raids by US military aircraft in the beleaguered northern Iraqi city of Mosul. The incident came only 3 days after a US airstrike hit the Iraqi army’s 3rd Division 55th Brigade near Fallujah and killed at least 10 Iraqi soldiers.